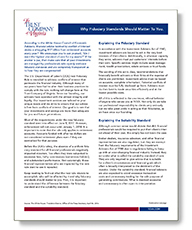 Why Fiduciary Standards Should Matter To You. The U.S. Department of Labor’s (DOL) new Fiduciary Rule is intended to address conflicts of interest that permeate the financial industry. Although many of our peers have had to alter their business practices to comply with the rule, nothing will change here at The Trust Company of Virginia. Find out what the new rule intends to accomplish, who will be affected by it and why fiduciary standards should matter to you. Please click on the link below to review our article.